Since you wrote “The Haywire Heart,” could you maybe give us some insight into what happened to Michael Goolaerts? Well, the autopsy maybe says he suffered a heart attack, and that it caused the crash. I say “maybe” because I’m not sure that something wasn’t lost in the translation of the AFP story from the French. That it says both “heart attack” and that “his heart stopped” also could be sloppy reporting by the wire service that lots of news outlet picked up. That same AFP story appeared all over the Internet, and reporters, like the public at large, often don’t understand the difference between heart attack and cardiac arrest or sudden cardiac death (SCD), and “heart attack” is often mistakenly reported when it was actually cardiac arrest. The part of the autopsy that says it happened prior to the crash gets no argument from me. In this video, it certainly appears that whatever happened to his heart happened very suddenly and while he was still on the bike, and it is what caused him to ride off of the road. A heart attack is a problem of blood circulation, and cardiac arrest is a problem of electrical conduction. A heart attack (aka “myocardial infarction) is caused by a blockage of blood flow to the heart itself. Lack of blood flow to a portion of the heart for a significant duration causes the death of heart muscle tissue; it does not necessarily result in the death of the victim or stopping of the heartbeat. Cardiac arrest is the result of a serious arrhythmia caused by malfunction of the heart’s electrical system. Ventricular fibrillation, which is rapid, disorganized contraction of the heart’s larger, lower chambers (ventricles), is often the arrhythmia associated with cardiac arrest or SCD. The ventricles supply blood to the body, brain, and lungs, so an arrhythmia in them is far more serious than one of the more common arrhythmias that originate in the atria (the heart’s smaller, upper chambers), which supply blood to the ventricles. Gravity will still get blood into the ventricles if the atria malfunction, but it won’t get blood around the body if the ventricles stop beating properly. Death comes minutes after the heart’s ventricles stop pumping. Many victims of SCD have been revived by the use of an automated external defibrillator (AED) in the hands of completely untrained bystanders. These are often found every kilometer or so at large running events and have saved countless lives. The operator needs only to place the paddles on the victim’s chest; the machine automatically determines whether a shock would be useful and delivers it if it is called for. Goolaerts received lots of manual CPR on the roadside, but I have seen no reports that he was given a shock by a defibrillator there. He never regained consciousness and died later in the hospital in Lille. Symptoms of heart attack typically come on slowly, even over days or weeks, although they may also be immediate and intense. If a blocked artery preventing oxygen from reaching a portion of the heart is not reopened quickly, that portion of the heart will die. And while the heart usually does not cease to beat during a heart attack, a heart attack increases the risk of cardiac arrest and sudden death, even during recovery. There are other conditions, some of them genetic, that may lead to disruption of heart rhythm and SCD. Some non-genetic ones, like heart failure, are typically related to age or diet, but cardiomyopathy is one that can be found in athletes, especially two types, namely an enlarged, thinned heart muscle (dilated cardiomyopathy), or a thickened heart muscle (hypertrophic cardiomyopathy) caused by enlargement of the cells. Both of these typically affect the ventricles. Changes in the heart’s muscle cells can lead to arrhythmia, and if it’s in the ventricles, to ventricular fibrillation and cardiac arrest. I have gotten plenty of mail speculating on doping as a possible cause, pointing to the much higher percentage of Belgian pro cyclists felled by heart problems than those of other countries. I don’t know whether further toxicology results might shed any light on this avenue; it hasn’t in past incidences related to Belgian pros. There are too many unanswered questions at this point to definitively answer your question, Terry, but I hope I have shed some light on it. I got a lot of mail about Sagan’s use of tools on his bike. Here’s a representative sampling that covers all of the theories I received. Your explanation was right on. Eric Schuda, who leads our Road Category, followed up with the team to check in and verify. [He said,] “Yes, Peter was just adjusting his stem. Cobbles are brutal on bike parts and it’s possible that his stem came loose. I had my bars slip last time I rode on the cobbles. You’ll probably hear this from many, but the stem on the Specialized Roubaix is not involved in setting headset preload. It merely clamps onto the moving extension of the “Future Shock” that is mounted in the steerer. 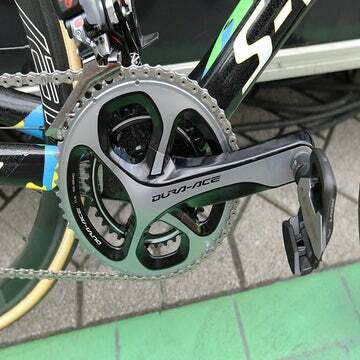 Preload is adjusted by two set screws, one on either side of the steerer and parallel to the steerer, in a collar attached to the steerer by a pinch bolt. This collar is under the teardrop fairing beneath the stem. There are locking set screws above and coaxial with the adjusting set screws. A loose stem would not affect headset preload and would simply be free to rotate about the steerer. I’m familiar with the consumer version of the Future Shock but not the pro version so can only conjecture that the knob on top of the steerer is a preload adjuster and or lock. I watched Sagan tightening his stem and read your related thoughts with interest. For what it’s worth, I have had a stem rotate slightly on a threadless steerer tube while riding. The combination in question is a bit dated — a 1990s Cinelli Sesamo 135mm stem of very questionable design separating a 25.4mm threadless steel steerer from a 26.0mm Nitto Dream bar. No shims involved at either end and all bolts were quite tight (15NM recommended, from memory). Riding over railway tracks en route to a hill time trial the bars rotated in the stem. 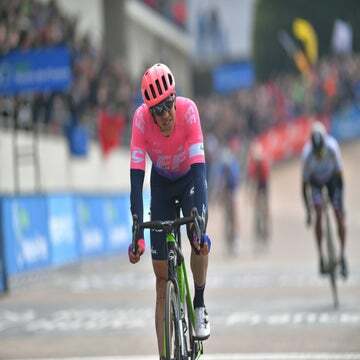 I tightened them up again, but during the race itself, which necessitated a fair bit out of the saddle, the stem also rotated slightly on the steerer tube. Just enough to be visually noticeable. I didn’t attempt to remedy this while riding(! ), but later solved the problem through application of carbon grip paste and retightening. Confidence was lost, however, and a forged aluminium Nitto stem seems to have provided a lasting solution. The stem is a Zipp stem. It takes a Torx key, not an Allen. The headset adjustment is completely separate from the stem adjustment on the Future Shock, unlike a traditional fork. The stem could be missing/loose/broken and the headset adjustment would not change. Can I suggest that it was not a loose stem bolt but actually a loose bolt on the collar that holds the steerer tube to the forks? The collar is tightened with a very small Allen key headed bolt. It would have felt like the bars were turning and, unless you had reason to look under the cover previously, you would not guess that Specialized would have designed road forks where the steerer is separate to the forks. I organize cycle events in the UK and have seen this problem on Specialized bikes with a headshock. It took us ages to figure out why clamping the stem bolts/shimming the stem was not making any difference.